First coached by his father, Calvin picked up Tennis in his early teen. A few years later, Calvin started working with a professional coach. Discipline and hard work, Calvin earned himself a top spot on his team and league division. He played varsity #3 doubles and moved up the ranking all the way to #1 singles during his junior and senior year. After High school, Calvin attended San Jose State University, unfortunately, SJSU did not offer Men’s Tennis. He still continued to train with other College players in the area, including those from Foothill college, De Anza College and Mission College. In winter of 2008, his love for the game turned to coaching. Calvin is known for his optimism, energetic, and helpful personality and really shares his love for tennis. He continually enjoys the sport and tries to get everyone of all ages to join. He joins NorCal tennis academy just in time for the 2009 Summer Program. Calvin is in charge of our Beginner and Development clinics. His work ethics since has had positive influence on the students. In February 2010, Calvin took his USPTA Certification Exam at Stanford University Tennis Center. Calvin now works closely with our Director in developing and implementing competitive training at NorCal Academy. He is in charge of our Evergreen Location’s Junior Development Program, where he works with many top high school players in the area. 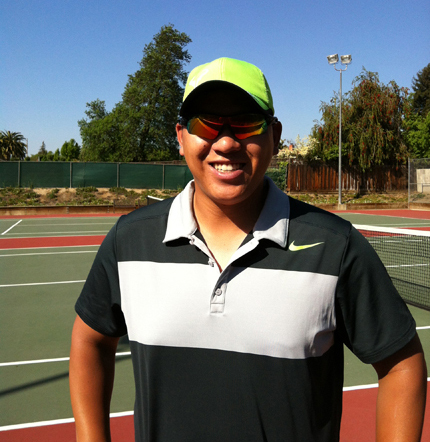 Outside of his group classes, Calvin now serves as the hitting coach for many state and nationally ranked junior players in the USTA Northern California sanction. His coaching centers around competitive and tournament development. Calvin has worked and now coaching many top Sectional and Nationally ranked players, his aggressive and upbeat style translate to some of the best training sessions for his students.